While everyone is preparing to eat Turkey for Thanksgiving the Paris Wildcats are preparing for their Area round matchup with 9-and-2 Kennedale. You can hear the game Friday on 101.9 KBUS beginning at 6:30. Elsewhere, Daingerfield will battle Harmony at Pine Tree Friday afternoon at 2:00 pm on STAR 96.9, Mt Vernon will take on James Madison at Forney at 4:00 pm on KLAKE 97.7, Pittsburg will face Rusk Friday night at Allen Eagle Stadium at 7:30 pm STAR 96.9, Paris plays Kennedale at Ron Poe Stadium McKinney Friday at 7:00 pm on 101.9 KBUS, Gilmer and Fairfield will clash Friday at 2:00 pm at Athens and Union Hill will take on Milford Friday night November 30 at 7:30 pm. After 21 seasons and over 3,000 hits, Texas Ranger’s third baseman Adrian Beltre has announced his retirement. 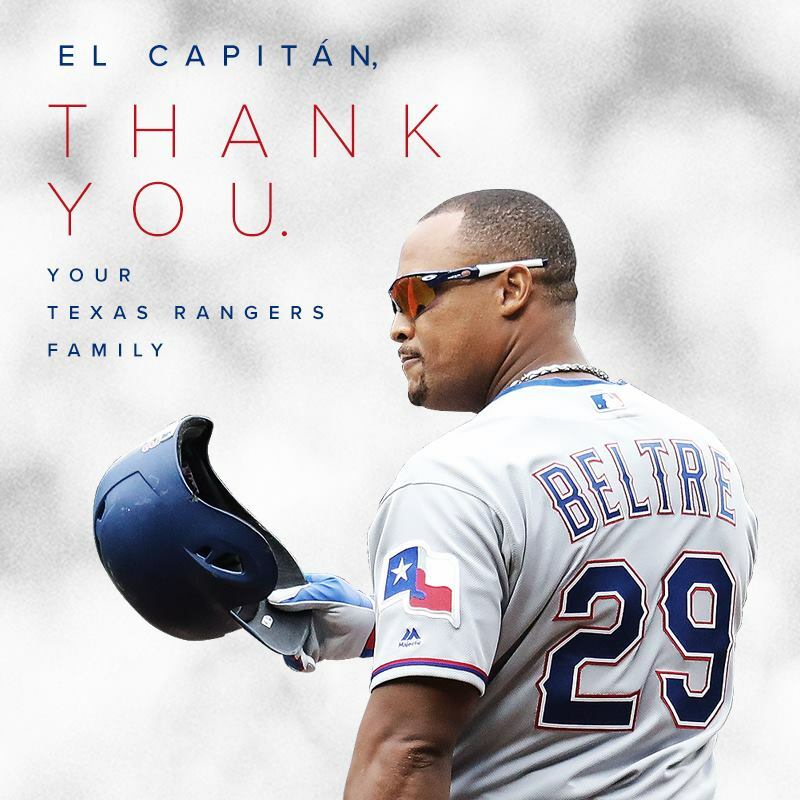 In a statement in which he thanked his family, fans, agents and former teams, and former Los Angeles Dodgers executive Tommy Lasorda, Beltre said it’s simply “time to call it a career.” Beltre, who will turn 40 in April, said in a statement released by the Rangers. Dallas Stars goalie Ben Bishop will miss at least a week with a muscle strain. Bishop left Monday’s game against the New York Rangers after two periods. Dallas is in Pittsburgh tonight to face the Penguins. Cowboys rookie receiver Michael Gallup intends to play in Thursday’s game against Washington despite learning just after Sunday’s win at Atlanta that one of his brothers had died over the weekend. Cowboys owner Jerry Jones said that starting TE Geoff Swaim will miss the next three to four weeks after he underwent surgery to repair a fractured wrist he suffered at Atlanta. There are three NFL games on tap Thanksgiving day. First, at 11:35 am Detroit travels to Chicago on CBS, then at 3:30 pm the Redskins visit Dallas on FOX, then the Atlanta Falcons take on the red-hot Saints in New Orleans at 7:20 pm on NBC. In College football Thursday, it’s the annual “Egg Bowl” as Mississippi State travels to Ole Miss for a 6:30 pm start on ESPN…..On Friday, Texas takes on Kansas on the road at 11:00 am on FS1. Investigators believe former Michigan State University president Lou Anna K. Simon lied to law enforcement officers during their investigation into how the school handled complaints about disgraced former doctor Larry Nassar. Simon was charged Tuesday with two felony counts and two misdemeanor counts of lying to the Michigan State Police, crimes that could land her in prison for a maximum of four years if she is convicted. A Michigan State spokeswoman said the university was aware of the charges and that Simon took an immediate leave of absence without pay this week “to focus on her legal situation. The College Football Playoff rankings remained unchanged in its top 10 this week following victories for each school — the first time in the history of the rankings that has happened. Alabama, Clemson, Notre Dame, and Michigan stayed put in the top four, with Georgia and Oklahoma still knocking on the door at No. 5 and No. 6, respectively. LSU, Washington State, West Virginia and Ohio State stayed the course to round out the top 10.